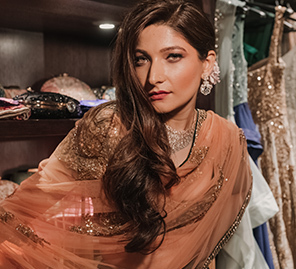 Bride-to-be Akanksha spent a day with WeddingSutra Favorites and brought to life her dream bridal look. 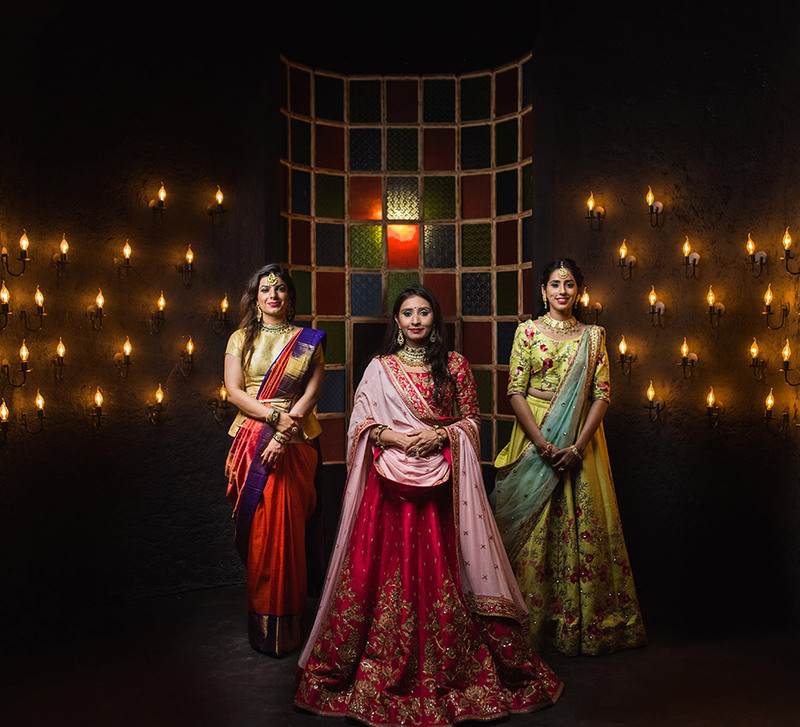 WeddingSutra, in collaboration with Lakmé Absolute and Kalyan Jewellers, brings you 'WeddingSutra on Location' – a curated showcase of top bridal trends and style statements from some of our WeddingSutra Favorites. 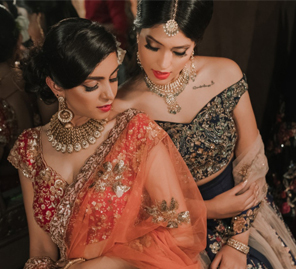 WeddingSutra’s most popular bridal initiative ‘WeddingSutra On Location’ took place at the sprawling Shyamal & Bhumika Studio at DLF Emporio in New Delhi. In the third of this three-part series, bride-to-be Akanksha takes a trip back to some of the most iconic decades in the history of makeup and flaunts a look that fuses a vintage vibe with modern appeal. When it comes to wedding makeup, many brides and makeup artists are eager to hop on to the latest trends. However, for Akanksha, it was yesteryears glamor that piqued her interest. Using products by Lakmé Absolute, makeup artist Shruti Sharma reversed time with her carefully crafted bridal look on Akanksha. She explored aspects of mod makeup that was made fashionable by one of the most popular models of her time -Twiggy, and mixed it with nuances that are typical of the 80’s vintage themes. 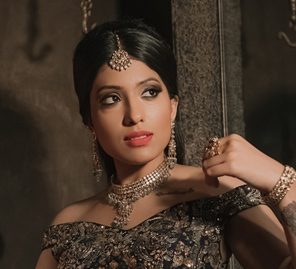 To go with her dramatic makeup, Akanksha needed jewellery that was just as striking. Handcrafted fine gold baubles from Kalyan Jewellers made for the perfect picks. When it was time to pick out her outfit, Akansha chose a red lehenga by Shyamal & Bhumika that offers outstanding bridal couture creations. The beautiful lehenga featured contemporary floral motifs and intricate thread work all over the skirt and blouse. The memories of the day were captured deftly by the Infinite Memories team, which made sure the bride felt entirely at ease while posing. To match the gold thread work on her lehenga, Ankansha was convinced that the heavy golden neckpiece she picked from Kalyan Jewellers was a perfect choice. It combined intricate craftsmanship with polki elements. The relief work around the neck was edged with circular motifs adorned with gleaming uncut diamonds. The set paired perfectly with a pair of polki 'chandbalis' (moon-shaped earrings). "I was given a few options to choose from, but I found myself drawn to this particular set. Not only did it go perfectly with my ensemble, it was also something that could be paired with a lot of other outfits. It was very versatile and something that I could imagine picking up for myself.” To complete her look, Akanksha also wore a gold ring with a large polki diamond in the center and a pair of kadas featuring intricate designs. To achieve Akanksha’s vintage-mod look, makeup artist Shruti Sharma prepped her skin by using the Lakmé Absolute Skin Natural Mousse – Hydrating in Velvety Beige. She then sealed the product in with the help of Lakmé Absolute White Intense Wet and Dry Compact. Getting dramatic with the eyes, she used the Lakmé Absolute Illuminating Eye Shadow Palette – Gold and lined Akanksha's lids with the Lakmé Absolute Precision Eye Artist Kajal in Black. To finish off, Shruti coated Akanksha's lashes with Lakmé Absolute Flutter Secrets Volume Mascara. The Lakmé Absolute Sun Kissed Bronzer enabled Shruti to impart an ethereal glow to the bride-to-be's cheeks, and the Lakmé Absolute Matte Melt Liquid Lip Color in Firestarter Red was the perfect touch.